Conditions use the Varnish Configuration Language (VCL) to define when an configuration object should be applied while processing requests to a cache server. Once you understand some basics about conditions, use this guide to learn about how to create conditions using the Fastly web interface and when to use them. 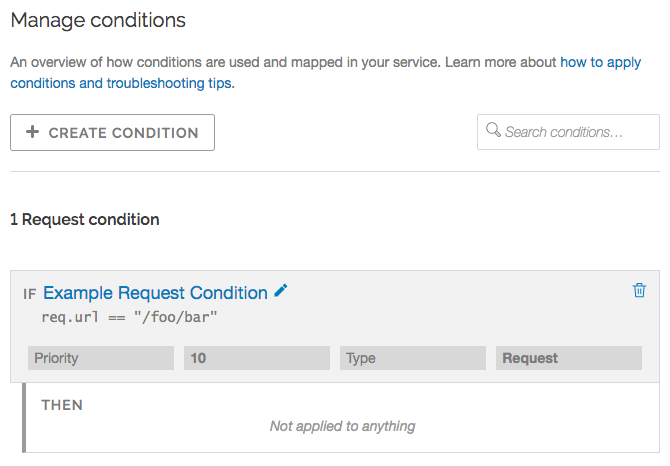 The Manage conditions page lists all conditions available to your configuration settings. Each configuration object displays conditions specifically attached to them. The Manage conditions page provides an overview of all the conditions currently available to your service. You can see at a glance which conditions are mapped to configuration objects. It allows you to create new conditions and search for existing ones. Click the Conditions link. A list of all conditions for your service appears. By default, configuration objects hide the majority of details for any attached conditions. You can unhide those details by clicking the Show details link. When expanded, the details vary depending on the type of condition. a Type parameter that classifies the condition being added. If added via the Manage conditions page, the type can always be manually selected. If added via the Attach a condition link on a configuration object, the type is automatically applied whenever possible. a Name parameter that serves human-readable identifier of the condition. an Apply if statement containing the logical expression to execute in VCL to determine if condition resolves as True or False. Most problems with conditions occur in the Apply if parameter. client.ip == "127.0.0.1" The client requesting a resource on your service has the IP 127.0.0.1.
req.http.host == "example.com" The host header of the incoming request is example.com. req.method == "POST" && req.url ~ "^/api/articles/" The request is a POST and the URL begins with /api/articles/. The client.ip, req.http.host, req.method, and req.url conditions shown above all represent configuration variables in VCL. Create a new origin server to handle the special API traffic. Create a new condition that tells the cache how to route some of the API requests to that origin server. 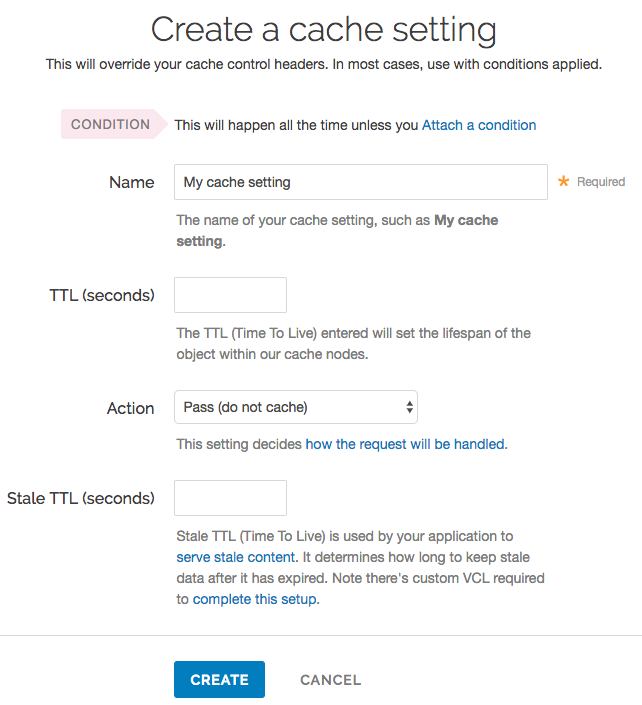 Create a new cache setting object to ensure the origin server caches only the correct responses. Create a new condition that specifies when the cache settings object should be applied. Create a new header to track the specific type of API requests. Create a new request condition to make sure that the header is only set on specific type of request. In the Name field, type a name for your API server (for example, Special API Set Header). In the Address field, type the IP address (or hostname) of the API server. 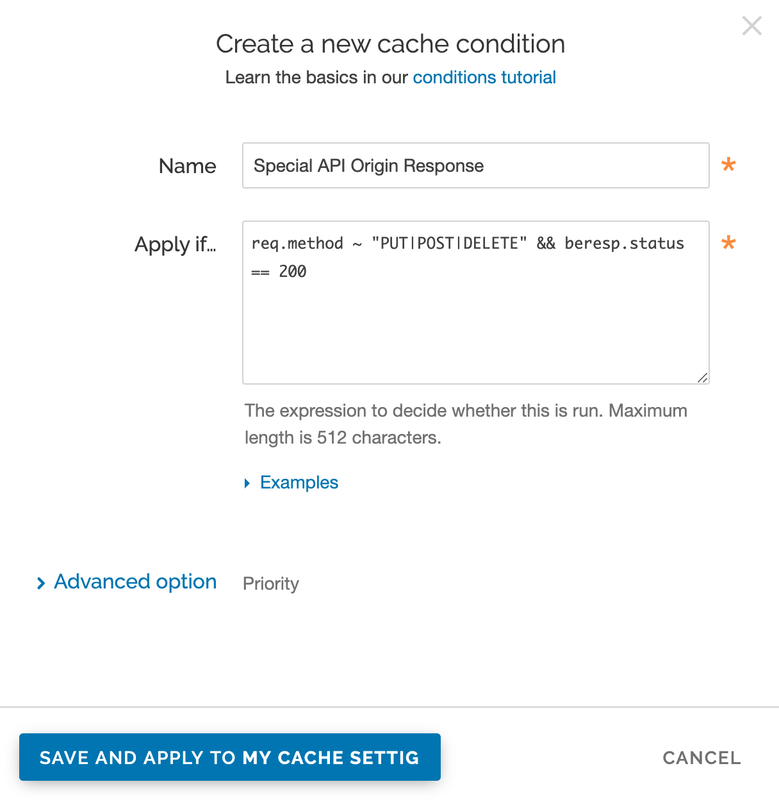 Once you've created a new origin server to handle the special API traffic, tell the cache how to route requests to this origin server by creating a request condition. In the Hosts area, click the Attach a condition link next to the name of the origin server you just created. The Add a condition to window appears. You can either select an available condition or you can click the Create a new request condition button. The Create a new request condition window appears. In the Name field, type a descriptive name for the new condition (for example Special API Request). 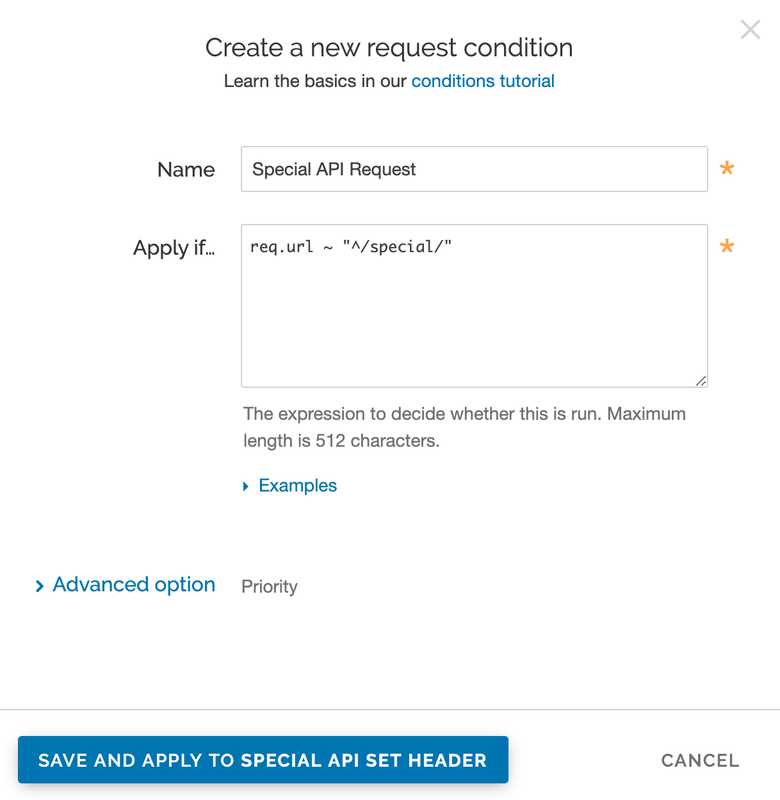 In the Apply if field, type the appropriate request condition that will be applied (for example, req.url ~ "^/special/" could address all requests related to the special API server). Click the Save and apply to button to create the new condition for the host. Requests are now are being properly routed to the new origin server. Next, create a cache settings object to ensure the origin doesn't cache any responses from PUT, POST, or DELETE requests. They're special for this particular API and send back extra, time dependent, meta-information in each response. In the Cache Settings area, click the Create cache setting button. The Create a cache setting page appears. In the Name field, type a descriptive name for the new cache settings. Leave the TTL (seconds) field set to its default value. From the Action menu, select Pass (do not cache). Leave the Stale TTL (seconds) field set to its default value. In the Cache Settings area, click the Attach a condition link next to the name of the cache setting you just created. The Add a condition to window appears. Click Create a new cache condition button. The Create a new cache condition window appears. In the Name field, type a descriptive name for the new condition (for example, Special API Set Header). In the Apply if field, type the appropriate request condition that will be applied (for example, req.method ~ "PUT|POST|DELETE" && beresp.status == 200). Click the Save and apply to button to create the new condition for the cache setting. To make sure you can track the effectiveness the new API, create a new header so you can use it to gather information about the special API requests as they happen. In the Headers area, click the Create header button to create a new header. The Create a header page appears. In the Name field, type a descriptive name for the new header (for example, Special API Set Header). From the Type menu, select Response and from the Action menu, select Set. 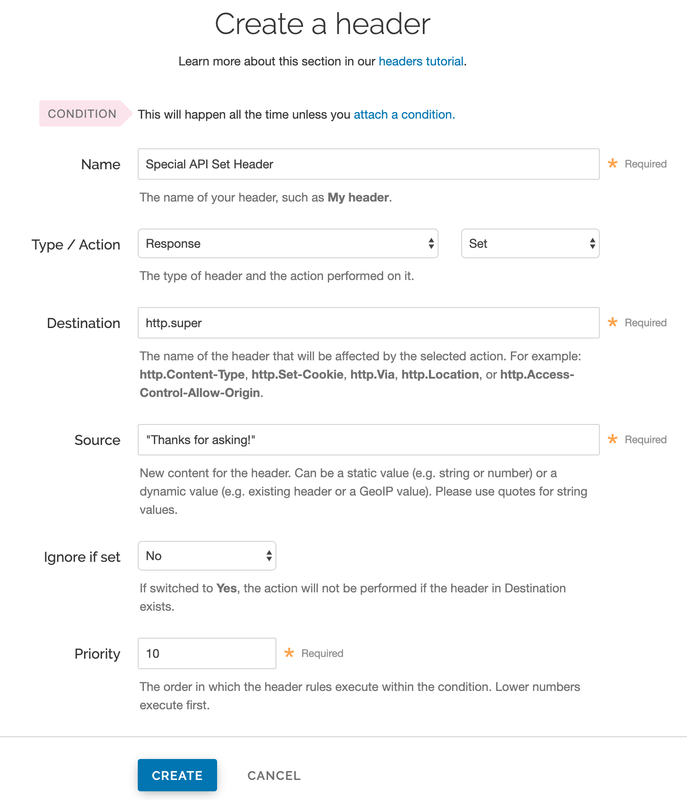 In the Destination field, type the name of the header that will be affected by the action (for example, http.super). In the Source field, type a description of the source where the content for this header comes from (for example, "Thanks for asking!"). Leave the Ignore if set and Priority fields set to their default settings. Once the header is created, create an associated condition to ensure this header is only set on that special type of request. In the Headers area, click the Attach a condition link next to the name of the new header you just created. The Create a new request condition window appears. In the Name field, type a descriptive name for the new condition (for example, Special API Response Condition). In the Apply if field, type the appropriate request condition that will be applied (for example, req.url ~ "^/special" && resp.status == 200). As you become more familiar with the VCL syntax and programming, look at the generated VCL to see if the configuration is doing what you think it is doing (most VCL is pretty simple once you know what the variables are referring to).